The industry may have been smaller in Taiwan compared to Hong Kong but the few makers that there were, they often intersected and crafted energetic entertainment. 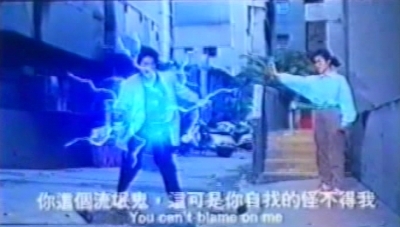 Case in point with former cinematographer Chong Yan-Gin having done Magic Warriors the same year, would go on to helm the wire assisted gunplay movie Revanchist and producer Lee Tso-Nam was already noted for his skill at low budget martial arts fare (Shaolin Vs Lama, Eagle's Claw). Also known as Magic Girl, Kung Fu Student gets by on pleasant energy eventually after threatening to be annoyingly broad initially. 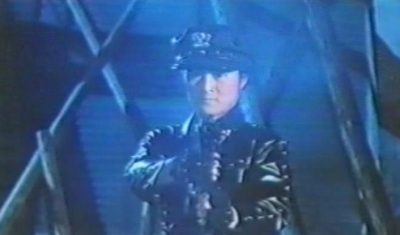 Although the opening kung-fu and gunplay battle with Lin Hsiao-Lu as a Rambo-style supercop is a bloody and violent dream sequence, this doesn't stop the movie from being both family friendly and quite adult. 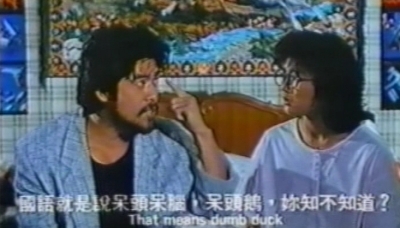 Taiwanese cinema were not afraid either to let many moods and plentiful content be at the forefront. 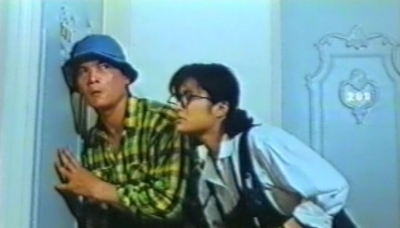 Chong Yan-Gin does almost derail the movie by having characters around Hsiu Went by very loud and broad though and we get several instances of stepping in dog poo comedy here. When the movie takes its supernatural turn however, the rhythm is very much spot on and entertaining. Rhythm in verbal delivery and execution of the supernatural elements (including the animated special effects) that is and from this point this basic exercise in otherworldly, comedic shenanigans, a little bit of heart, martial arts and gunplay rarely if ever dips. This lies with Chong of course but also in the energy brought by leads Lin and Alexander Lo Rei. In particular the latter is having fun as the typical loud and even mean spirited triad but the turnaround in the relationship between these two is fairly sweet. It leads to a montage of everything going very well, to heartbreak, to Hsiun possibly perishing when his violent back story bleeds into Hsiu Wen's and it takes an acceptance of the valid nature of featuring a plethora of light and dark moods in a comedy. Even if you do, it's easy to accept and validate Chong Yan-Gin's varied work here.